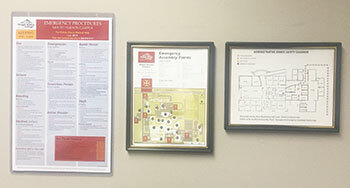 Emergency procedures, emergency assembly point maps and building safety evacuation diagrams are also posted at various locations in each campus building. DAY CLASSES: Every effort will be made to make a decision to close or delay Day Classes prior to 6:00 am. EVENING CLASSES: The decision to close Evening Classes will be made by 3:00 pm. Go to www.skagit.edu for any changes to operations. Messages will only be posted that reflect a change in operations. (For example: We WILL post a message saying we are closed. We WILL NOT post a message saying we are open). Recommended: Sign up for the SVC RAVE Alert system. Click here for details and to sign up. Rave Alert is Skagit Valley College's official emergency notification system used to communicate with students and employees during campus emergencies. Students and staff with SVC-issued email addresses are automatically enrolled. The system is used to communicate with students and employees in the event of a college emergency or weather-related delay or closure.